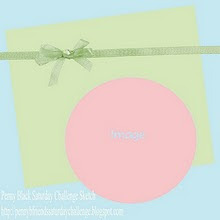 It's a sketch challenge over on the Penny Black Saturday challenge blog today.. The penny black stamp is called 'In a nutshell'. Cardstock, Designer paper & Ribbon are all Stampin Up. Gorgeous card, love the sweet PB image and the beautiful colours.